When Laura and Rich, who live in Singapore, decided to tie the knot they needed to find the ideal wedding destination that would not only suit their ideas of having a beach wedding but where most of their friends and family could travel to who are based in the UK. They both wanted to make sure that all their guests could travel to their big day as the family had not all been together for a while. Their idea was to create a complete celebration and excuse for distant relationships to be reunited and for everyone to join in the fun, so they decided to have their wedding in Spain. The destination was perfect, only a short flight away from the UK with the idea of great weather, blue skies and the beach; a perfect excuse for everyone to have a holiday and share in Laura and Rich’s wedding in Spain. The bridal couple met Angel, one of our wedding planners at Sunshine Weddings Spain, who toured them around the coastline of Malaga. Laura and Rich fell in love with the idea of getting married in Estepona Spain, a stunning beach side town just outside of Marbella. They choose a very chic and modern looking beach club wedding venue in Estepona, Spain to hold their main wedding celebrations. Once the venue had been booked our team of wedding planners in Spain set to work and began to put together a fun filled itinerary which would last 5 days for all Laura and Rich’s wedding guests to enjoy. The guests all arrived and flew into Malaga Spain taking a short 30 minute transfer to their hotel in Estepona which offered a group rate so everyone was able to stay together. Day one – the wedding party took a lovely stroll down to Estepona Marina where everyone became re-acquainted with each other after so long, and enjoyed drinks well in to the night. Day two – a wonderful authentic Spanish spread had been laid out in the Old Spanish quarter of Estepona Spain. Guests ate and drank and talked about old memories and how excited they were to spending such quality time with each other. If it hadn’t been for Laura & Rich’s wedding in Estepona Spain, then it would have been quite a while before they would have had the chance of being altogether as one group of close family and friends once again. Day three the rehearsal dinner was a relaxed short walk to a bay, over looking the Atlas mountains, where a BBQ spread lay awaiting the wedding party for their rehearsal dinner which they all thoroughly enjoyed. They watched the sun set into night in anticipation for what lay ahead of them the following day. 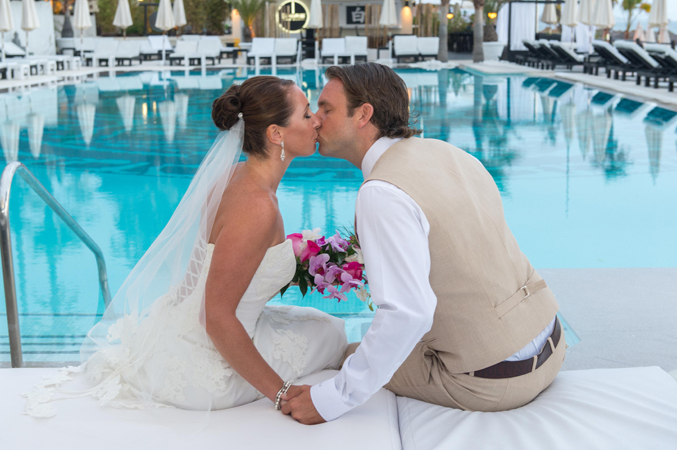 Day Four – Laura and Rich’s big wedding day in Estepona Spain had arrived, they had opted for a beach wedding ceremony at 6pm which gave everyone loads of time to relax and get ready to be in full party spirit. The ceremony began and Laura took her walk towards her husband Rich down the beach, surrounded by golden sands and the views of the Mediterranean waters. The area was laid in white and off set with stunning fuchsia flowers fastened around chairs, which only added to the elegance of this perfect beach wedding in Spain. The day ran to perfection and everyone absolutely loved the beach wedding setting in Estepona, with its chic elegant style and a place to party which they all did well into the night, but only once they enjoyed a cocktail hour with canapés by the pool and then tasted a delicious meal in the outside dinning area along with a scrummy wedding cake. Then the DJ came on and took this wedding in Spain to a different level, which carried on into the Spanish night. Day Five – They returned to the Bay that they had fallen in love because of the stunning scenery and views of the Atlas Mountain. This completed their fun packed wedding in Estepona Spain. Here they said their final goodbyes and thanked all their friends and family for making they’re 5-day wedding celebration so amazing. They waved goodbye to their wedding guests at the end of the night with mixed emotions; having to say goodbye but thankful that they would be taking such wonderful memories with them along the next step of their trip to enjoy their honeymoon in Brazil. Congratulations Laura and Rich we truly enjoyed making your 5-day wedding celebrations a success for you both and all your friends and family !! !